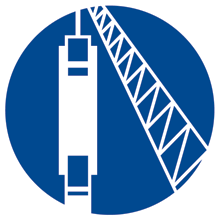 PVE is a worldwide supplier of sophisticated piling and drilling rigs and accessories. The range consists of modern and low maintenance equipment. The range of products can be summarized as: hydraulic powered pile driving and drilling machines, hydraulic impact hammers, rotary heads, power packs and accessories like auger cleaners, concrete pumps and pile driving leaders. Müller vibrators from ThyssenKrupp Tiefbautechnik GmbH. One of the global leaders in the area of vibration technology.